1. What is the function of the kernel of an operating software? **The kernel provisions hardware resources to meet software requirements. 2. 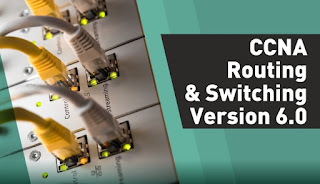 A network administrator needs to keep the user ID, password, and session contents private when establishing remote CLI connectivity with a switch to manage it. Which access method should be chosen? 3. Which procedure is used to access a Cisco 2960 switch when performing an initial configuration in a secure environment? **Use the console port to locally access the switch from a serial or USB interface of the PC. Use Secure Shell to remotely access the switch through the network. 4. 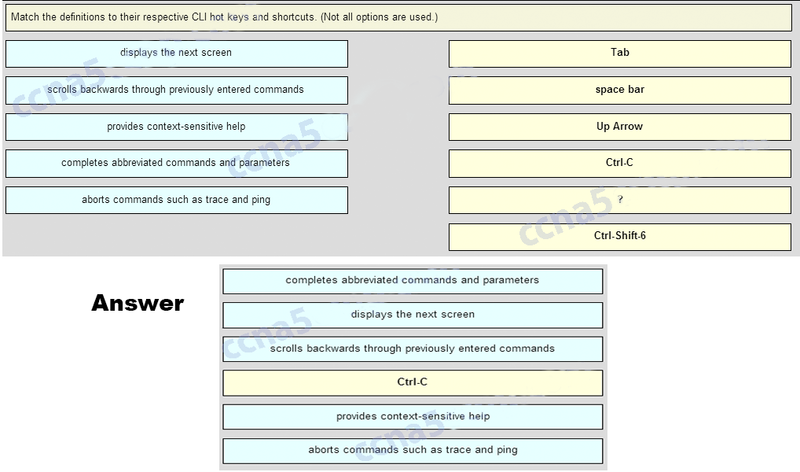 Which command or key combination allows a user to return to the previous level in the command hierarchy? 5. A router has a valid operating system and a configuration file stored in NVRAM. The configuration file contains an enable secret password but no console password. When the router boots up, which mode will display? 7. Which information does the show startup-config command display? 8. Why is it important to configure a hostname on a device? 10. How does the service password-encryption command enhance password security on Cisco routers and switches? **It encrypts passwords that are stored in router or switch configuration files. 11. Refer to the exhibit. A network administrator is configuring the MOTD on switch SW1. What is the purpose of this command? 12. While trying to solve a network issue, a technician made multiple changes to the current router configuration file. The changes did not solve the problem and were not saved. What action can the technician take to discard the changes and work with the file in NVRAM? **Issue the reload command without saving the running configuration. 13. 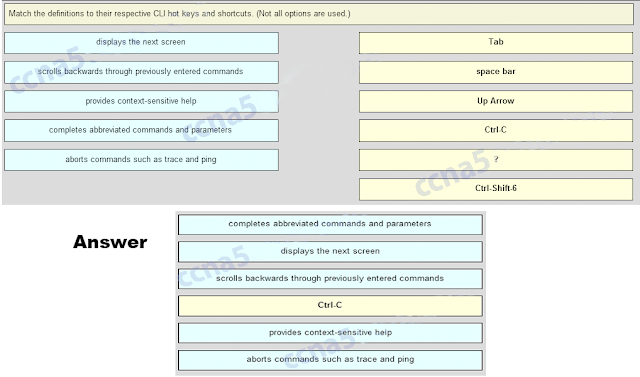 Which statement is true about the running configuration file in a Cisco IOS device? **It affects the operation of the device immediately when modified. **The configuration that is actively running on the device is stored in RAM. **The contents of RAM are lost during a power cycle. 15. Which interface allows remote management of a Layer 2 switch? 16. Which interface is the default SVI on a Cisco switch? 17. 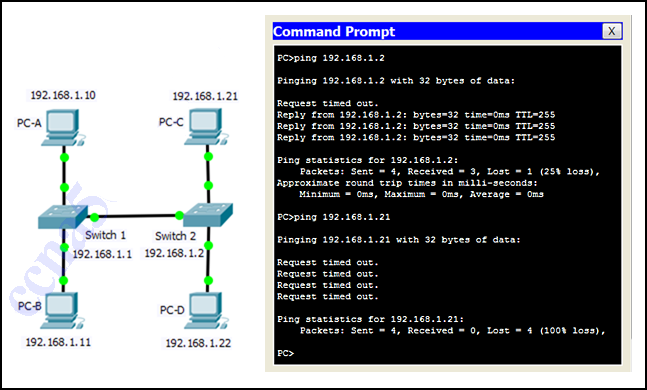 Why would a Layer 2 switch need an IP address? 18. What command can be used on a Windows PC to see the IP configuration of that computer? 19. A technician is adding a new PC to a LAN. After unpacking the components and making all the connections, the technician starts the PC. After the OS loads, the technician opens a browser, and verifies that the PC can reach the Internet. Why was the PC able to connect to the network with no additional configuration? **The PC was preconfigured to use DHCP. 20. What is a user trying to determine when issuing a ping 10.1.1.1 command on a PC? **The switch can be remotely managed. **One device is attached to a physical interface. **The default SVI has been configured. Publicado por El Guille en 4/11/2017 05:47:00 p. m.